Dougal Turner died in Somerset West, Cape Town, on 30 October 2009. He was born in India on 4 February 1922. His school was the Imperial Service College which later moved from Windsor to amalgamate with Haileybury; thus Dougal ranked as an Old Haileyburian and he relished the fact that Rudyard Kipling was a fellow Old Boy by the same token! When the Second World War broke out in 1939, Dougal joined up as soon as possible. He was captured in North Africa and spent his 21st birthday as a prisoner -of-war. Years later, he recounted that while ‘in the bag’, he had had every opportunity to study the general traits of men from diverse countries of ‘Empire’, and had decided then that if ever he emigrated , it would be to South Africa. At the end of the war, he went up to St Edmund Hall to read Classics. His years at Oxford were among his happiest and he maintained strong links with Teddy Hall throughout his life. After graduating, Dougal sailed for South Africa to teach English at Hilton College, an independent boys’ boarding-school on a magnificent estate in the Natal Midlands. Between 1949 and 1954, he was Housemaster of Pearce House (and 60 years later at his memorial-gathering, a number of those who had been members of his House so many years previously, spoke movingly of the influence he had had on their academic, sporting and character development). In January 1955, having just married Jill Gray who was teaching Art at a nearby girls’ school, he moved to Rhodesia – to Falcon College, a recently-founded, independent, boys’ boarding-school on 3000 acres of Matabeleland ‘bush’, thirty miles south of Bulawayo. Three sons were later born here. The boys’ nickname for Dougal was DET – his initials – and in 1984, his Chairman of Board suggested that those three letters might serve to identify the attributes that Dougal possessed in all facets of good Headmastership : Dignity – Example – Tolerance, with (when absolutely necessary) just a touch of the Thumbscrew! Time and again, in public and in private, Dougal reiterated that life and education at Falcon should not be divorced from the march of events in Southern and Central Africa. One marvels at his grasp of the area’s political, economic and social movements, when one remembers that the Central African Federation was in existence when he arrived at Falcon, but that during his term as Headmaster, it was acrimoniously dissolved (1963), Nelson Mandela was jailed for life (1963), Malawi and Zambia became independent (1964), Ian Smith declared UDI (1965), Botswana became independent (1966), ZANLA began a guerrilla war against Rhodesian whites (1972), Angola and Mozambique gained independence (1975), Bishop Muzorewa became the first black Prime Minister of Zimbabwe-Rhodesia after whites voted to give up total power (1979), the Lancaster House Conference agreed to a ceasefire and majority rule in a new Zimbabwe (1979), and that country became independent with Robert Mugabe as Prime Minister (1980). What extraordinary skills, together with dogged determination and unlimited perseverance, must Dougal have employed in order to lead Falcon safely through the maelstrom of difficulties during those times! Indeed, it is perhaps not too fanciful to claim that Dougal Turner’s leadership and example in those years enabled Falcon College to survive so successfully in Mugabe’s Zimbabwe to this very day? In Central Africa, Dougal was a respected leader amongst the Heads of independent schools. 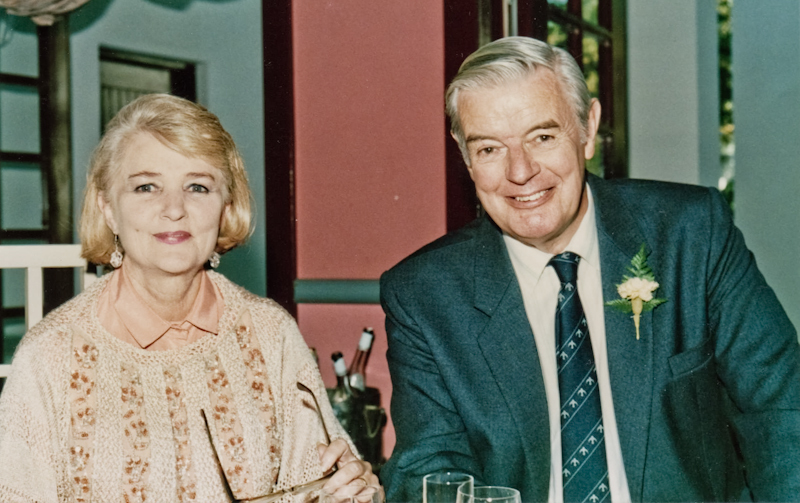 This continued when he and Jill moved to Johannesburg in 1985 and he was recruited to take charge of the secretariats of South Africa’s Association of Private Schools and the Heads’ Conference, positions he filled with distinction until his retirement to Somerset West in 1995. Of him, a colleague said: “He was a shy and private person, but a great listener and very wise; he was always most sensitive to the needs of others and generous in passing on his knowledge and experience”. Dougal is survived by his wife Jill and son John in Somerset West, his son Bruno in London, and his son Guy in Melbourne, Australia.